쇼가 시작하기 전, 박수 소리가 나기 시작했다. 격렬한 열정! 놓친 게 있다면 오직 빅터앤롤프 쇼의 레드 카펫을 걸어가는 매혹적인 얼굴들뿐이었다. 저기 그녀가 온다! 머리(적갈색 헤어를 포함)부터 발끝까지 강렬한 빨강으로 꾸민 여자! 빅터 호스팅과 롤프 스노렌의 이번 꾸뛰르 컬렉션은 하나의 위트인 동시에 심오한 사색이었다. 모델들에게 네덜란드 제조사인 데소(Desso)의 카펫 원단을 입히면서 레드 카펫에 대한 열광을 비웃는 것. 암스테르담에서 온 음악 전공자들은 위층 갤러리에서 스티브 라이히(Steve Reich)의 ‘Clapping Music(박수만으로 이루어진 음악)’에 맞춰 박수를 치며 특별한 퍼쿠션 공연을 펼치고 있었다. 그 동안 모델들은 다양한 의상들(가령 무릎 위에서 모아 부풀어오른 코트 드레스, 표범 무늬가 들어간 드레이프 스커트)을 입고 빨간 런웨이를 걸었다. 옷들은 눈에 띄는 절개나 솔기 없이 몸을 감싸며 아름답고도 흥미로운 형태들을 만들어냈다. 새로운 핏빛 분위기 속에 실루엣들은 때론 이해하기 힘들었지만 전체적으로 기교 있어 보였다. 빅터앤롤프 쇼는 매번 다르다. 그러나 효과는 거의 늘 같았다. 사회학적 맥락을 포착해내는 두 사람의 뛰어난 지성. 그러나 옷 자체는 그들을 뒷받침해주는 생각과 수준 차이가 상당했다. The clapping began even before the show started: wild enthusiasm! 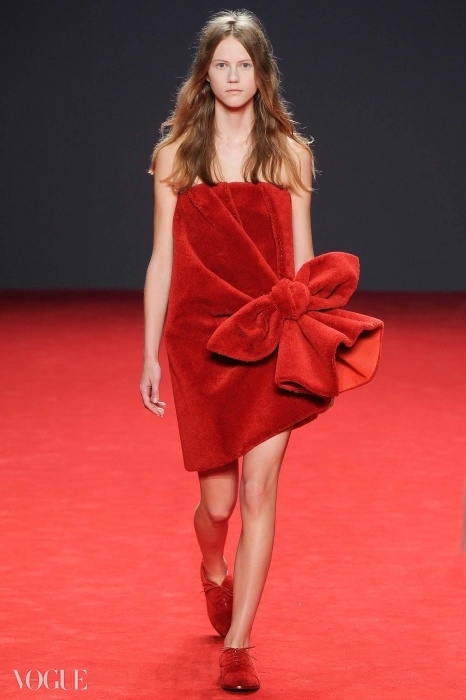 The only thing missing was a stream of glamour-pusses to walk the red carpet at the Viktor & Rolf show. There she was! 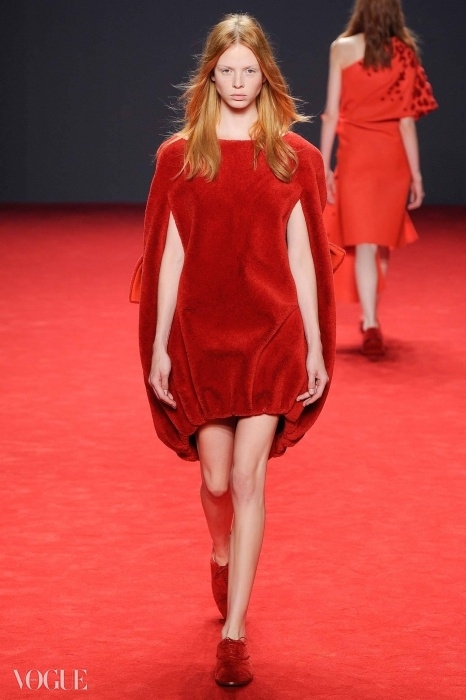 A fiery red figure from head (russet hair included) to toe-slippers. 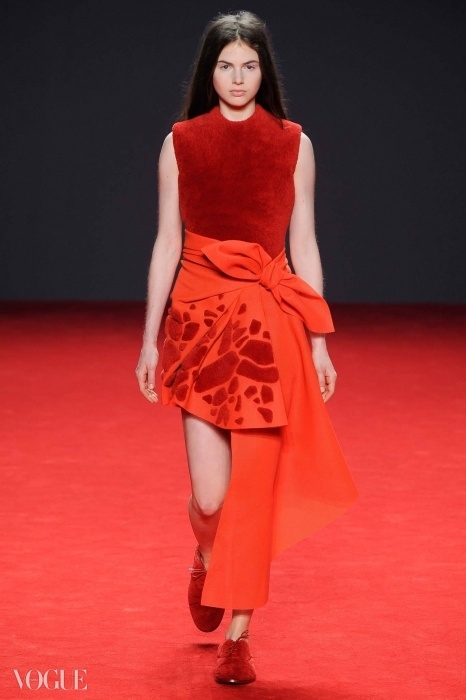 This haute couture collection from Viktor Horsting and Rolf Snoeren was another witty but profound thought: to make fun of red-carpet mania by putting the models in carpet fabric from Dutch manufacturer Desso. 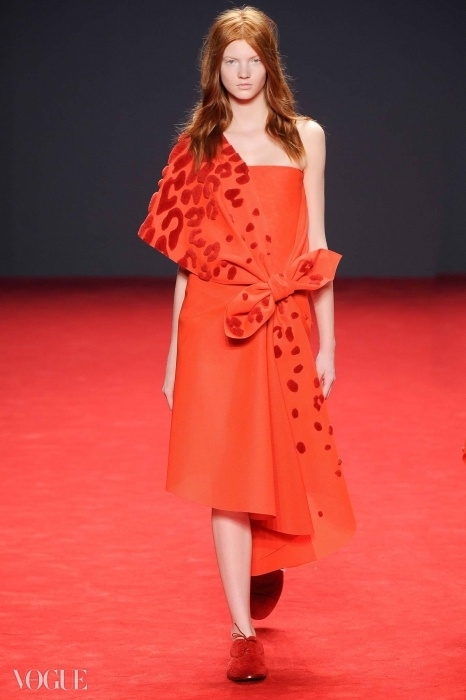 While a group of music students from Amsterdam clapped a special percussion performance in an upper gallery, to Steve Reich’s “Clapping Music”, the models worked the red runway in a variety of outfits: a ballooning coat dress gathered above the knees; a drape-hip skirt with a leopard pattern; a strapless dress knotted at the front. 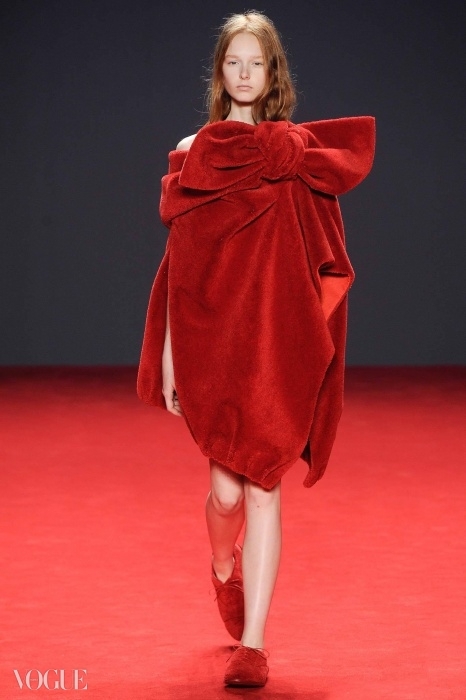 The clothes were wrapped round the body with no apparent cut or seaming, making some beautiful or intriguing shapes. The silhouettes seemed artful, although difficult to comprehend in the miasma of fresh-blood red. Viktor & Rolf shows are so different, but almost always the same in effect. Two brilliant minds catching a sociological thread. But the clothes themselves not quite at the same level as the thought behind them.